Hummus makes a healthy addition to a low-carb diet because it's packed with fiber and vitamins that contribute to your overall well-being. It's a moderate source of carbohydrates, so you may struggle to fit hummus into a very low-carb diet. But, if you follow a more relaxed low-carb diet, you can likely make it work. Hummus is made from chickpeas, tahini (sesame paste), garlic, lemon juice and olive oil. Chickpeas are high in carbs, but after they're mixed with the other ingredients, which are all low in carbs, hummus ends up with a moderate carb count. One-third cup of homemade hummus has 16 grams of total carbohydrates. By comparison, commercially prepared hummus may be a better choice if you're counting carbs, because the same portion has 12 grams of total carbs, according to the U.S. Department of Agriculture. If you're following a weight-loss plan, be aware that 1/3 cup of homemade hummus contains 144 calories compared to 135 found in commercial varieties. On the positive side, all of the carbs in hummus are healthy complex carbs that take longer to digest. As a result, they enter the bloodstream at a gradual rate, don't spike blood sugar and give you sustained energy. Fiber is included as part of the total carbs, but it's not broken down into energy. Fiber fills other essential roles as it travels through the digestive tract. For starters, it helps you feel full and keeps blood sugar balanced by moderating sugar absorption. Soluble fiber also lowers levels of cholesterol, while insoluble fiber adds bulk and moisture to stool to prevent constipation. One-third cup of homemade hummus has 3 grams of fiber, while the same portion of generic commercial hummus has 5 grams. These values represent 12 percent and 20 percent of the daily value, respectively, based on a diet of 2,000 calories per day. Some people like to use net carbs when they're trying to limit carb consumption. This term hasn't been defined by the U.S. Food and Drug Administration, but net carbs are generally recognized to mean total carbs minus fiber -- in other words, the amount of carbs that break down into energy. Foods contain two types of fiber -- insoluble and soluble. For purposes of calculating net carbs, you should subtract only the insoluble fiber. The lack of definitive guidelines for calculating net carbs means you can't depend on them to be 100 percent accurate. That's especially true for foods like hummus, which have multiple ingredients. However, hummus supplies 14 grams of net carbs in 1/3 cup of homemade hummus and 9 grams of net carbs in store-bought hummus. The Dietary Guidelines for Americans 2015 -- 2020 recommend getting 45 to 65 percent of your daily calories from carbs, or at least 130 grams each day. Dropping below 130 grams is a low-carb diet, while consuming 30 grams or less is generally considered to be a very low-carb diet. But those values aren't written in stone. You'll see a variety of different cut-off points for very low-carb diets, because the FDA hasn't developed the official definition of a low-carb diet. You can easily work the carbs from hummus into a low-carb diet, unless your total daily goal is around 30 grams or less. 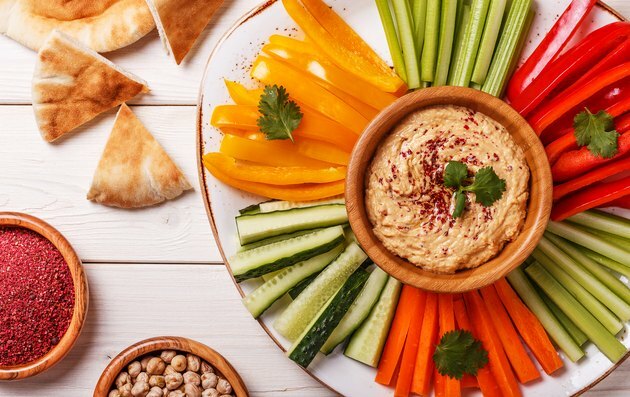 Hummus is often used as a dip for veggies and enjoyed as a snack, which still leaves 38 grams of carbs for three meals if your goal is 130 grams of daily carbs. But make the snack more substantial by adding extra veggies to turn hummus into the basis of a low-carb meal. Hummus can also be used as the primary source of carbs in a meal. Use it as a dressing for chicken salad or mix it with orange juice and olive oil to make a dressing for a spinach salad. Diabetes Forecast: What Are “Net Carbs”?